Hi Paul, count me in. See you at 9. Volunteers Needed for Schaumburg Fishing Show. I can do Saturday 10-3. Sounds like fun, count me in. My daughter and I got back last night. We had a very enjoyable trip. The weather was great but a few more clouds would have been welcome. Most of the time the fish were neutral. Most areas where there had to be many fish we could only get a fish or two to bite. Still there are were enough biting where we ended the trip with 145 fish between us. Of those fish we got one 24.5" northern and 9 walleye with 6 in the 15.5" to 18" range. I recently got a bump board so was able to get accurate length measurements. The longest smallies were 19.25", 19", 19" with several 18.5" to 17" range and numerous 16" fish. Those smallies sure can put a fight! Ned rigs were the baits we threw the most but also caught them on fat ikas and 5" Kalins grubs. I could only caught a half dozen on top water.They would only hit within a couple feet from where the bait hit the water. The walleyes mostly came on jerk baits. Thursday we had a full boat with Lauren, Rich, John and myself. The morning was slow but after we stopped for lunch and went back out they were "on" and we put 51 on the boat for the day. There were a couple of sturgeon that hung around the lodge. Add me to your count. Add me to your list. I plan on camping both nights I will be bringing my kayak. Thanks Norm for the post. I took the day off of work, signed up and am planning on going. Sounds like a good trip. I should know in a few days if I can make it. I picked up a bag of California Craw RTDs and Finesse Shroomz weedless green 1/10 oz. 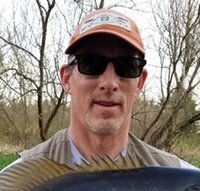 I tried them on a river I have never fished, the Elkhart river in Indiana. This was over the Labor day weekend. The first day was good with 3 dozen smallies caught and few largemouth and rock bass. The sizes were small but had a good time. I fished varies baits but the ned rig was by far the most productive. The second day I concentrated on types of spots where I caught the bigger fish. I caught 24 with most in the 13 to 14" range. Not big, but average size was much better than day 1. 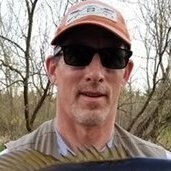 All fish were caught on the ned. The smallmouth were under overhead cover next to current. I would drop the ned next to cover and they would dart out and grab it. Usually only one fish per spot. I already have picked up more plastics and jig heads. The weed guards work great. Rigged backwards after catching over 20 fish. Typical location they were at. Scott thanks for putting the trip together again. Please put me down for two for the 8/15 - 8/18 slot. Scott, the internet connection is fine. The house is great and river beautiful. My daughter Lauren and I came up yesterday. We caught 15 fish in the afternoon. She caught the big one, a surprise 27" 7lb walleye. Today we worked all day for them switching between the boat and kayaks. We landed 36 smallies with an average size of 15". Again my daughter caught the biggest one, a little over 18". It was a beautiful day. Lots of eagles, and a playful otter. We saw several big sturgeon. They can make some startling splashes!